Click on the arrows to continue your journey upstream or downstream. The names of the tributary streams that flow into the big river above Savanna hint at the people who once left footprints in the sand and mud there, and the rich history they left behind: Tetes de Mortes, Sinsinawa, Little Maquoketa, Bloody Run. 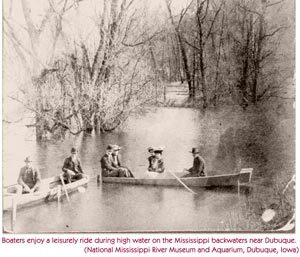 Not many years before the steamboats of the Grand Excursion chugged past in 1854, the banks of the Mississippi were populated by the villages of the Meskwakie (Fox), Sauk, Oto and Ioway Indians, and a few French traders. Julien Dubuque founded the first European settlement in Iowa when he was given a lead mine near the site of Dubuque by the Meskwakie in 1788. A few years later the Spanish territorial government (then owner of the territory west of the Mississippi River) granted him a sizable land tract to expand his Mines of Spain. Dubuques settlement included several hundred Meskwakie, and a few dozen French-Canadian miners. The mine produced an estimated 10,000 pounds of lead a month, which was sold in St. Louis. Julien Dubuque died in 1810, fabulously wealthy and beloved by the Meskwakie. Nearby Galena, Ill.,  a town named after the Latin word for lead ore  gave doubly to the Civil War effort: it mined the lead that took many men's lives and was home to General Ulysses S. Grant and his family when the war started. The picturesque, historic town now attracts a steady flow of visitors who keep its restaurants and bed & breakfasts busy year-round. In Dubuque, the wealth of lead was later supplanted by a bonanza of logs floated down the Mississippi and diversified by meatpacking and shipbuilding industries. About 1,600 people now work at John Deeres large campus on the north end of town. This construction equipment division of the Moline-based company is the largest employer in Dubuque. Today, visitors can still canoe one of the tributary streams and see the landscape of the Meskwakie, visit General Grants house in Galena or hike to Julien Dubuques tomb on a blufftop overlooking the city. Gramercy Park, on the bluff above East Dubuque, Ill., contains 26 Hopewell Indian mounds, some of which are huge. Ice Harbor, in Dubuque, is home to the Mississippi River Museum, a great place to learn about river history. It will be expanding into the Americas River complex by 2004. Americas River will include aquariums, a wetland and a River Discovery Center where visitors can simulate piloting a 15-barge tow upriver. The Mines of Spain Recreation Area, just south of Dubuque, has miles of trails. The 146-acre Eagle Point Park, on the north end of Dubuque, has playgrounds, picnic shelters and eagle-eye views of the river. Dubuque is right across the river from the Illinois-Wisconsin state line. In fact, one of Dubuques bridges goes to Wisconsin and the other to East Dubuque, Ill.